BE ADVISED: The cemetery rules, regulations and proceedings are subject to change at any given time. We will not be responsible for any such changes. For up to date information please call the cemetery (951) 653-8417. This section of our website was created to help our customers better understand how Riverside National Cemetery runs their funeral services. Many of our customers call in and express their concern for prompt delivery of their flower arrangements. Not to worry! We deliver there on a daily basis and most often more then one service per day. 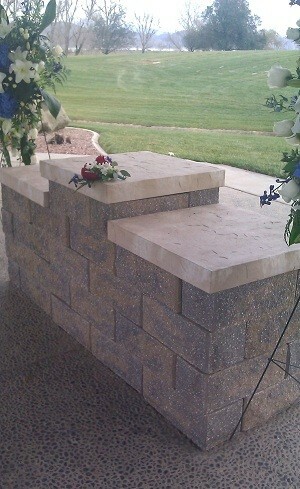 We have years of experience delivering to the cemetery and have good communication with the cemetery representatives. First, you will be asked for a date and time along with a staging area number. Please have the name of the deceased (Full legal name) and not a family members name. We (the florist) will be needing this information to deliver. When you arrive at Riverside National Cemetery, you will pull up to the information booth. They will direct you to the service you are attending. STAGING AREA: Please note the staging area is just used as a parking area- a place where family and friends can park and gather minutes before the actual service. 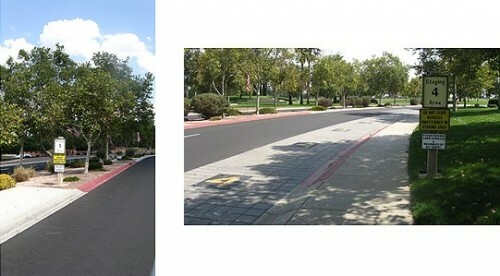 For instance, if you were told to meet at staging area 2, you will look for a posted sign which reads Staging Area 2 .Then if you look on the pavement you will see a red zone ( do no park in the red zone- this is parking for the Hurst and/or representative of the cemetery) keep this area clear and park BEHIND this zone. DO NOT park ahead or across because you will be in the wrong service. TIME: For example, if you were told the service is at 10:15 that’s when the representative drives up and parks in the red zone. He/she will get out and talk to the immediate family. This is the time were all family and friends return to their vehicles and get ready to follow the representative. (Do not carpool from here, take your vehicle) You will then follow the representative to a committal area. (Note: Do not arrive more than 30 minutes ahead of schedule because you will be asked to wait elsewhere). COMMITTAL AREA / SHELTER: is just like an outdoor patio. Each shelter has a name, A through G. The letter of the shelter is not known until minutes before the representative arrives at the staging area. The representative will then count all vehicles in your service and decide which shelter your service will be held at because all shelters have driveways with different lengths. Once you arrive to the shelter, the actual service runs 20-30 minutes long. Be sure to quickly exit your vehicle and walk to the shelter immediately. When the service is over, be sure to take all your belongings with you. The next of kin will have the choice of taking the flowers home or leaving them at the gravesite location. Note: Actual gravesite locations may not be available for family members to visit right away. Up to 3 flower arrangements will be taken to the grave site by cemetery employees and placed on top or nearby. Therefore, they do not want an excessive amount of arrangements. We have delivered to services that have well over 30 flower arrangements and they will not turn flowers away for the service. However, you will likely be asked to take some with you. You may donate them to the "grave of the unknown" ask your representative for more information. GATHERING TIME: Once the service is over, do not stay at the shelter. If you do, u will be interrupting the next service that will be taking place shortly. If you would like to congregate, it would be best if accommodations were made elsewhere. For instance, at home or a nearby restaurant, for example. #1: Standing sprays, wreaths, crosses, open hearts, solid hearts. (recommended because of the wide-open space where the services are held.) Most likely these types of arrangements will go to the grave site. #2: If there will be an urn present (cremation) a centerpiece or wreath to go next to or around the urn is our next suggestion. This arrangement, along with the urn will go on top of a table. (table dimensions: top is square 2ft x 2ft - and is approx. 3.5 ft in height) most tables have 3 tiers ,as shown in the picture and few have one tier. #3: Basket arrangements of fresh flowers (these will most likely be set on the floor) Easy to transport, can take home or leave at grave site. #4: Plant/Garden basket, or a single potted plant. Easy to transport, intended to be taken home. Fresh flowers may also be added. *One-time, weekly, bi-weekly, monthly & holiday deliveries to plots/ gravesites are available, please call us for more information. 951-789-6375. A photo of gravesite deliveries is also available to you for a small nominal fee. Example of grave-site memorial arrangement. 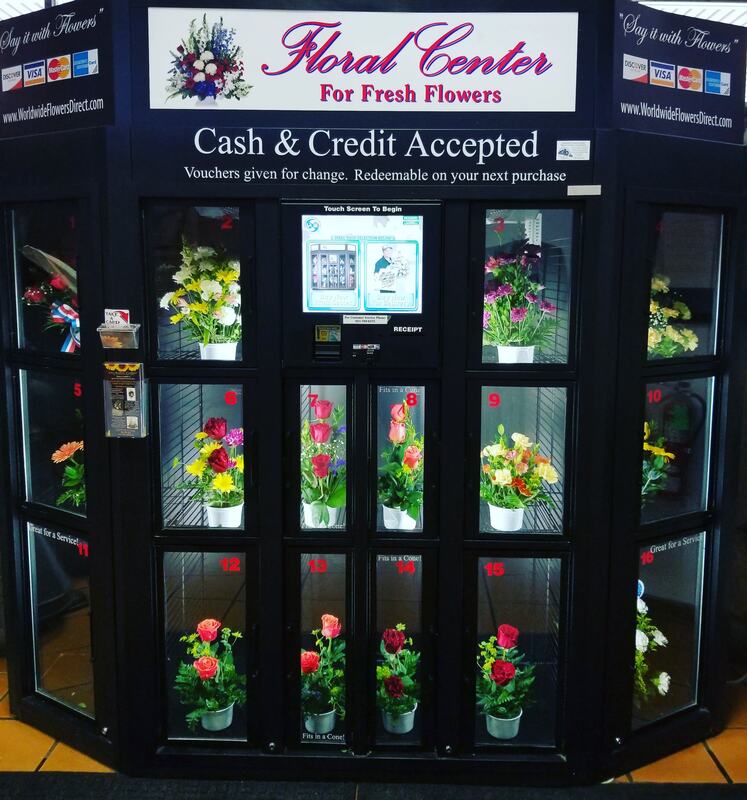 *Visit our Floral Vending Machine on site: This machine has 16 different flower arrangements to choose from. It has a touch screen & takes most major credit cards as well as cash (No change will be given, but credit vouchers will be awarded). Located in the lobby of the administration building. Fast, easy & convenient. We recommend calling in advance to make reservations. please call us. We love to recommend & support our local businesses.